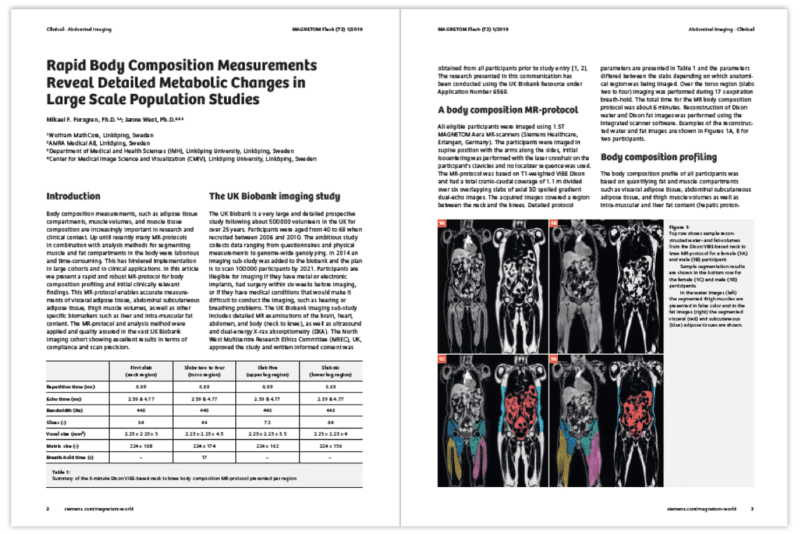 Linköping, Sweden [November 23, 2018]: As part of the partnership with Siemens, AMRA has written an article “Rapid Body Composition Measurements Reveal Detailed Metabolic Changes in Large-Scale Population Studies” published by Siemens. The article presents the robust and rapid neck to knee MRI-protocol for Siemens MRI-scanners that can deliver high technical success rates in large-scale population studies. The MRI-protocol and AMRA’s Body Composition Analysis method were applied and quality assured in the vast UK Biobank imaging cohort showing excellent results in terms of compliance and scan precision. The article includes insights about the initial clinical findings based on analyzing the body composition profile in such a large population. All eligible participants in this study were imaged using 1.5T MAGNETOM Aera MR-scanners (Siemens Healthcare, Erlangen, Germany). We believe that this is a widely applicable method in a clinical and research setting, investigating metabolic disease, muscle degenerative disease, as well as metabolic components of other diseases. The simultaneous assessment of multiple important fat and muscle compartments increase the understanding of the complex interplay between disease development and metabolic processes.